In October of 2017, we began major construction on our children’s spaces, which meant changing around some rooms to keep Promiseland operating. This meant transforming our main overflow venue from being a space for 800-1000 people to view service to being a secure space to hold 600 kids. That meant we needed to do some work on existing venues in order to accommodate all of the folks who enjoyed watching in overflow. 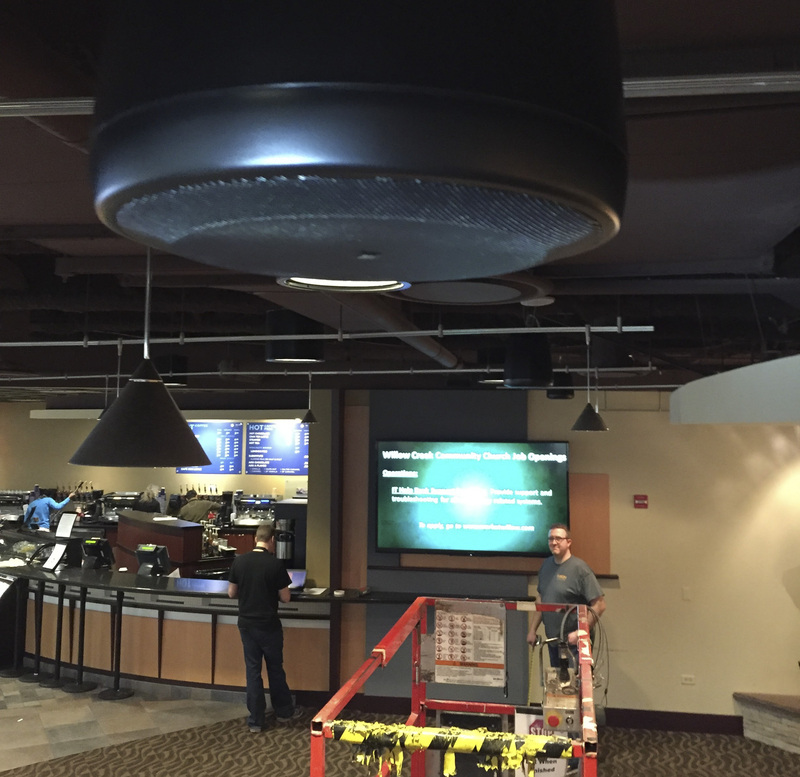 So, we installed a few new TV’s and sent program audio to speakers that were already installed those spaces. One of those overflow spaces was Dr. B’s, South Barrington’s coffee shop. The decision was made swap the existing 40″ TV for an 80″ TV but not to upgrade the audio system and to instead use the existing gear. The challenge with this plan is it did not provide sufficient coverage. The speakers didn’t get loud enough without distorting to be heard over the coffee shop and lobby noise during a service, and the system wasn’t automated. Prior to this year, Dr. B’s had a basic audio system with five Polk Audio Atrium45 speakers scattered throughout the space. There was a Sima SSW-L6EX six-speaker selector that was set to control each of the five speaker ”zones” individually. 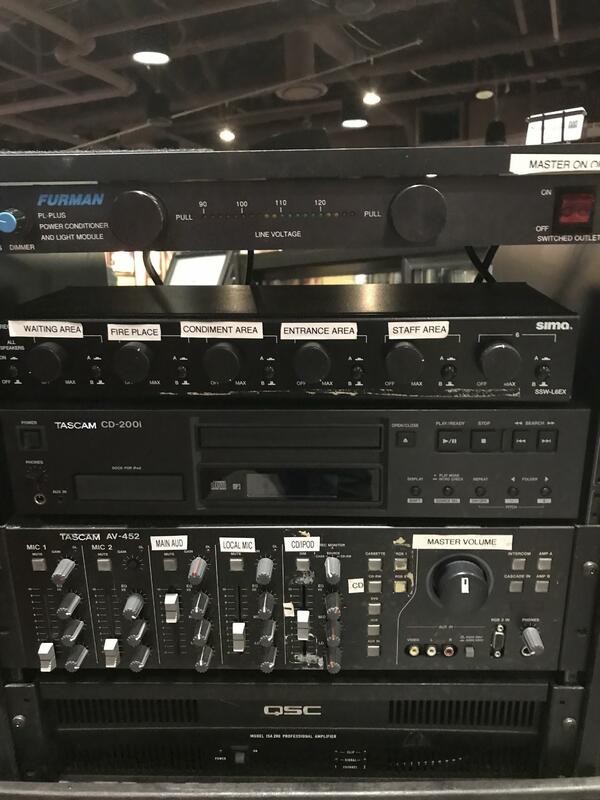 For a mixer, there was a Tascam AV-452 that took a feed from a Tascam CD-200i for local music either played off a CD or using the AUX IN from a PC running Pandora. The Dr. B’s staff members were supposed to switch between the local background music to the service feed before each service, but if they were busy or a volunteer didn’t know when or how, the switch didn’t happen and our team would get a call 10 minutes into service saying the audio wasn’t on. In response to this, our team came up with a proposal for speakers with full coverage of the Dr. B’s area and a simplified Digital Signal Processor (DSP) that could be programmed and scheduled to turn on and off for daily operation and then for service times. 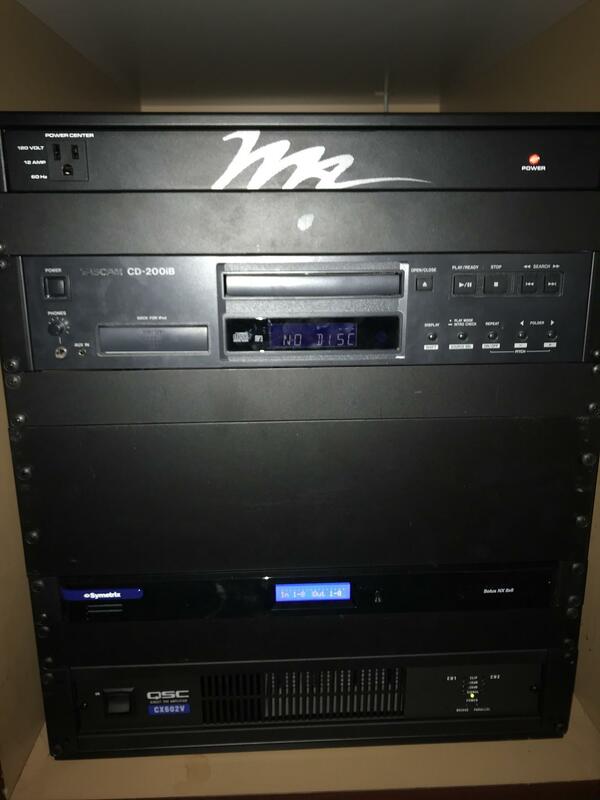 The final installation consisted of fourteen JBL C65P/T pendant speakers, one Symetrix Solus NX 8×8 DSP, one QSC CX602V amp, and one Tascam CD-200iB. The weekend service audio signal for comes off of a Cobalt BBG-S-to-H converter that de-embeds the program audio that is embedded with the SDI video signal. This then goes into a Whirlwind LM2B so that it goes from an unbalanced signal to a balanced signal that can be sent directly to one of the DSP inputs. What we ended up installing due to a ceiling height change that occurred during installation. 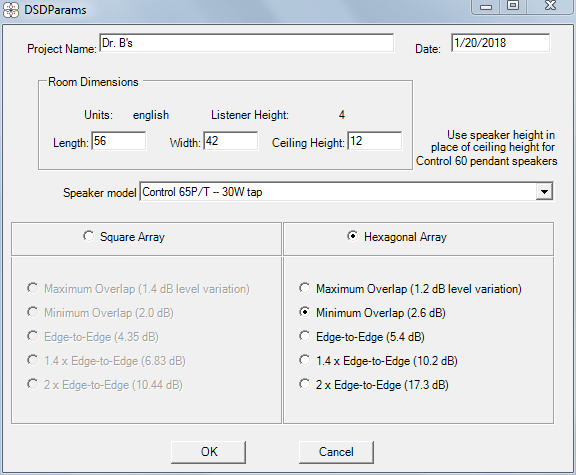 We utilized a tool that JBL provides called Distributed System Design that allows system designers to define the width and depth of a space, desired speaker type, what tap you want to use if it’s a 70V system, and what the height of the speaker will be. 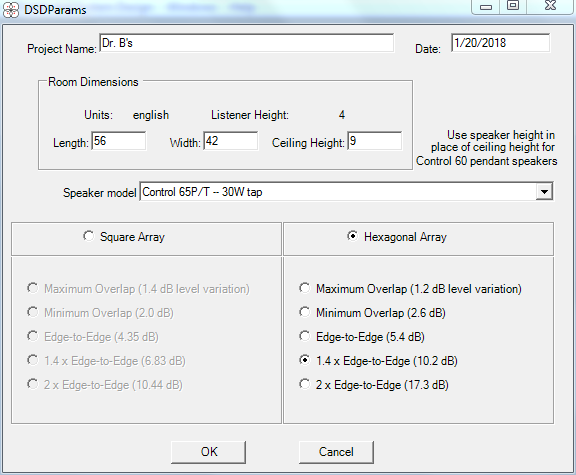 You can then choose what your overlap between speakers will be. 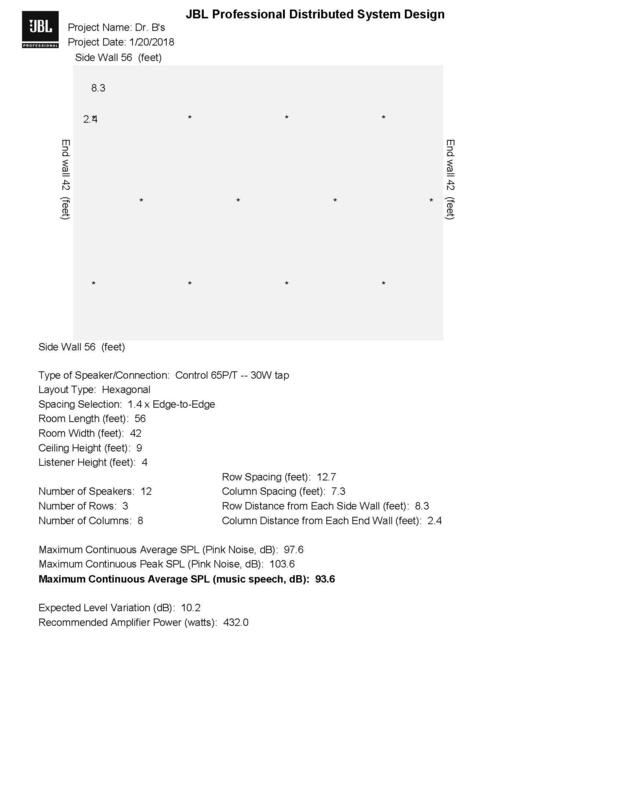 Our preference was to do a hexagonal array with a minimum overlap between speakers. The reasoning for this is that it provides the most consistent coverage and the listening audience is then less likely to perceive that they are walking in and out of audio coverage. 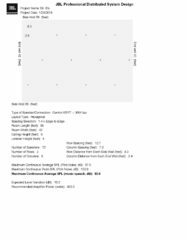 Once all of that information is input, a layout of the speakers, a report of the average and max SPL you can expect, and then what the recommended amplifier power should be. 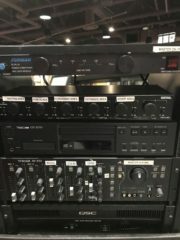 All of this information was done ahead of time which allowed us to pick the number of speakers and the correct amplifier. Once the gear arrived, because the install space was not a perfect rectangle, we choose the largest width and depth and then laid out the room according to the plan by putting painters tape on the floor and then shooting a laser point up to see if the points were clear. This allowed us to know what we were going to rig off of and if we needed to move any of the speakers from the original plan. There was a little hiccup in the design because, at one point, the speakers were going to be rigged off of the ceiling deck which was at 12’, however, that would have involved our Building and Trades team drilling into concrete and so we made a call to rig the speakers off of existing truss, which brought the speakers down 3’. This ultimately affected the dB variation more we normally prefer, but it is not really noticeable because most of the listening audience members are sitting at bistro tables drinking coffee. We chose the DSP because there wasn’t going to be a mixer in the system. Because this is an isolated system, we were able to save some money by not going with a DSP that had Dante. All of the sources were routed directly to the inputs of the DSP. 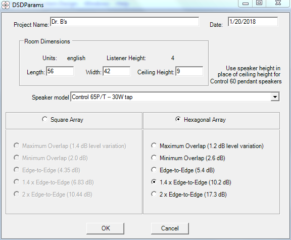 This gives us ability to set up and control presets and then schedule individual sources on and off. 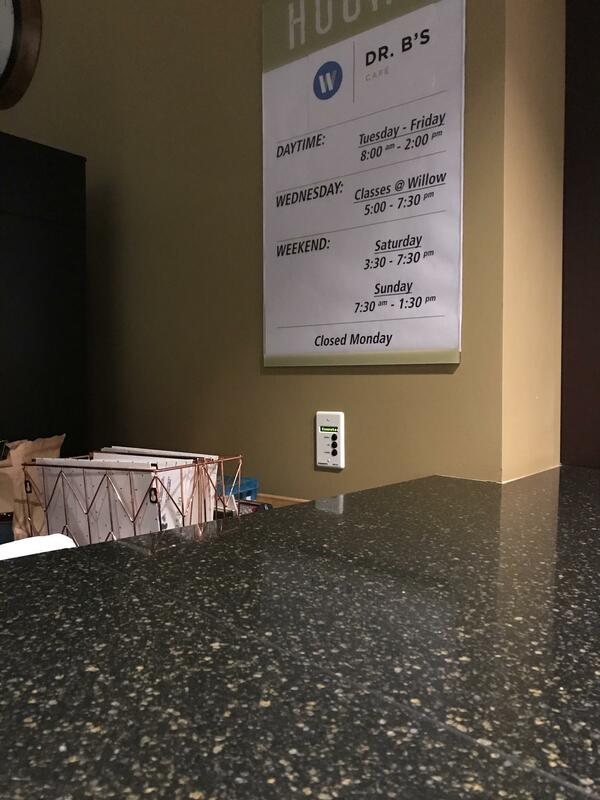 The presets and scheduling ability allows the coffee shop staff to stay present with their jobs and to not have to worry about the audio being on the right source during the week or around service times. Since there is no physical fader for the user to adjust volume, the Symetrix DSP line utilizes something called ARC panels. 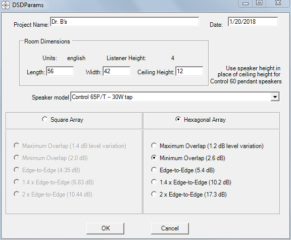 We added an ARC-2e that lives above one of the counters and is in reach of the people in the coffee shop or one of our guest connection people can turn up or down the volume locally. The system has been well received and now people can sit in the entire coffee shop and hear music during the week and then clear music and the message content for services!